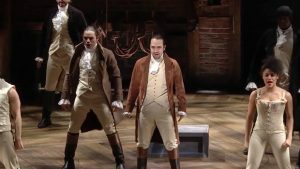 By David Begnaud, CBS Sunday Morning | When Lin-Manuel Miranda took the stage in his revolutionary creation, “Hamilton,” back in 2015, he made theatre history. He soon left “Hamilton” behind for a flurry of other projects, which included writing songs for the animated film “Moana” that earned him an Oscar nomination. And this past Friday he was honored with a star on the Hollywood Walk of Fame. But for three weeks in January, Miranda will take a step back, and resume his role in “Hamilton” – not to change history, but to change lives. Nearly 15 months ago, Hurricane Maria ravaged the island of Puerto Rico. By some estimates nearly 3,000 people died. The storm led to the largest power outage in U.S. history. Not long after the storm, Miranda returned to the island where his parents were born, and where he spent summers as a young boy. Correspondent David Begnaud was with him as he toured what remained of his grandparents’ home in Vega Alta. And it was during that visit that he announced that he would reprise the role that made him a star. The 24 performances are part of a $15 million fundraising effort that Miranda is leading. Proceeds from the show will go to supporting the arts on the island. “I know, it’s too full circle!” Miranda laughed. “Because you know, Hamilton was supposed to go back; they said, ‘Here’s money for a scholarship, go become a doctor, and then come back.’ And he never came back. He got a little busy with the revolution! Story produced by T. Sean Herbert.